'For Julia Snowden, the Founder's Day summer celebration in Busman's Harbor, Maine, means helping her family's clambake company to prepare an authentic taste of New England seafood. Any Mainer will tell you that a real clambake needs wood for the fire...so why is there a foot sticking out of the oven? 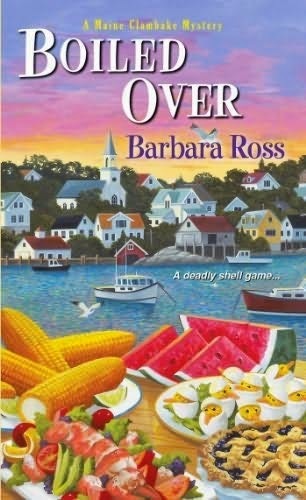 The townspeople want to pin the murder of the RV park owner on Cabe Stone, a new employee of the Snowden Family Clambake Company--who bolted from the crime scene and disappeared. Julia knows having another murder associated with her family's business is a recipe for disaster...but who is the killer? I enjoyed the first book in this series, Clammed Up so much that when I was approached to read this one, I just couldn't pass it up. I absolutely adore the setting and the atmosphere that the author has created in this series. It is just a dream to be reading about Maine in the summertime. The author has a way with describing the setting so well that I practically want to pack my bags and run away to Maine right this instant. Believe me, if I could I absolutely would. I can't describe how this author weaves her words to make an utterly stunning setting that I escape to every single time I picked up this book. Julia Snowden has returned from Manhattan to help save her family's clambake business. She is quickly making her way around the small town of Busman's Harbor, Maine and is even involved in the preparation of the Founder's Day celebration. When one of the committee ends up dead in Julia's family's clambake fire, nonetheless, she is determined to clear her family's name and bring a killer to justice. When one of her own employees is accused, she steps in and begins an investigation that will prove that he had nothing to do with it. Using her smarts and her determination, she discovers who had motive, means and opportunity. I simply couldn't put this book down. Between the stellar storyline and the picturesque setting, I really found myself escaping to Busman's Harbor and unraveling a murder mystery. If you haven't the opportunity to discover this series yet, please do so, as you are missing out on a fabulous and well written cozy mystery. Can't wait for the next release so I can return to Maine and spend some more time with Julia and her family. Disclaimer: This book was given to me by the author in exchange for my honest review. I reviewed this book without compensation of any kind. All thoughts and opinions are solely mine.